Ada is one of five CVN Serving with Sisters Ambassadors – volunteers sharing the joy, energy, and fulfillment of serving alongside Catholic Sisters in CVN member programs, through creative reflection, conversation, and experience. This is her last post as her volunteer year comes to a close – thank you for following Ada and her fellow Ambassadors over the course of their service year! My community members and I took a trip to Alcatraz and Angel Island last weekend. With the year winding down, we want to spend as much time together as possible! 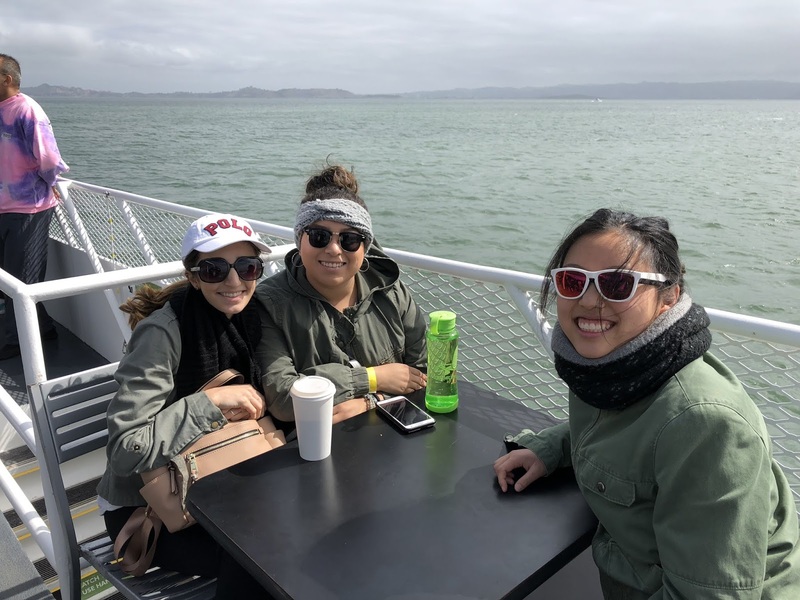 Trips like these are always special ways for us to bond and connect with each other…as well as be a tourist in San Francisco! I know you’re probably having excitement and joy, but also doubts and worries as you contemplate the opportunity to serve. A little more than a year ago, I was in your position. In 2017, I would never have thought that I would be moving across the country, serving alongside incredible people, forming compassionate relationships with the marginalized of society, and living in intentional community. I had no idea how much I would change and grow as a person. I had no idea how much a year of service would change my life in all aspects. Of course, there were times I struggled- and not just financially. There were moments I felt discouraged and had doubt in my faith or in the reason why I was placed here. There were instances of strife and trouble. But in the end, it has all been part of a greater journey of finding myself and being happy with who I’ve become. 1) Dare yourself to use your faith in any and every way possible. Before I embarked on my adventure with Vincentian Service Corps West, I struggled with my faith. I was unsure about where I was in my relationship with God. Going to church was the least priority in my mind, and I did not have a faith community with whom I felt comfortable. This year, I wanted a change and so I dared myself to try to see God in all aspects of my life. The moment I let God become the main factor of my life, my eyes were opened and I started to sense His presence everywhere. I no longer see God only at church service. Now, I see God in the everyday, in every moment, and in every person. I see God in the people I’m serving- a God of mercy and truth. I see God in my community members and the support system I have developed here- a God of service. I see God in the moments of being happy and in the beautiful nature of San Francisco- a God of love. By opening myself to seeing God everywhere, I truly do see Him everywhere. But I also see God in those not- so- nice moments. I see God with me as I struggled to connect with a person I was serving. I see God as I made the hard decision to switch service sites mid-year. I see God in the times my community members and I did not get along. Despite those moments being ones of difficulty, knowing I had God with me in each one gave me utmost inner peace and clarity. I have been able to find God working in me- transforming my heart and molding me into the person I’m meant to be. Future volunteer, I dare you to use your faith in every way possible. I dare you to see God in every moment, in every person, and in every day, too. One of the biggest things I have learned through my time at The Epiphany Center is the power of compassion- for others and most importantly for myself. We all make mistakes and we all have struggles- we are only human and no one is perfect. To admit you are vulnerable and need help is one of the most empowering and bravest things you can do. We live in a time where we are often told that we must stay strong, we can’t express our feelings, and we need to hold in our emotions. The clients of The Epiphany Center have shown me that to admit you’re in need of help and to not be afraid to seek it, is one of the first steps in healing. The clients all have various backgrounds- many from trauma, self-doubt, and fear. But holding in these worries prohibit you from becoming your full, beautiful self. I have been touched by the determination of these clients. They express tenacity in becoming the best women they can be. They have forgiven themselves and learned from their mistakes to move on to become better people. Future volunteer, I ask you this: to above, all trust in the work of God (whether or not it is the pace we desire). Pierre Teilhard de Chardin, SJ, has said, “Give Our Lord the benefit of belief that His hand is leading you, and accept the anxiety of feeling yourself in suspense and incomplete.” Believe that He is leading you in the right direction and see this as an opportunity to trust in your faith more. Before I embarked on the adventure that is a year of service, I was facing a lot of personal issues. I felt lost and confused and unsure of the direction my life was going. This left me very frustrated. When it came time to move across the country and start over in a new city, I was hard on myself when I couldn’t automatically make new friends or get adjusted to the directions and finding my way around. I was living with new people I’ve never met before and readjusting the way I lived. Forgiving yourself for the missteps in your life journey is the way to achieve your whole self. Taking it easy on yourself through the struggles that this year brings will allow you to see God in even the most difficult of moments. Future volunteer, I implore you to know that good things take time to come to fruition. The best is yet to come. Take it easy on yourself. That’s the best we can do in this one life we are given. I donated 90% of my stuff to charity the summer before I left for California. This was the hardest, but first, step for me on this journey. I struggled, cried, complained about letting go of my possessions- to the point where my friends had to forcibly take things away from me. But once I let them go, a huge wave of relief settled over me. How much of those things that I owned affected a huge part of my life? By letting go of the material possessions that I once thought owned me, I was stripped down to my basic and simple core. Now, I can focus on myself and the work God has planned for me. Let go of the things weighing you down, of worldly items, and let God provide and work through you. And so future volunteer, I end this letter with a choice at the crossroads of your destiny. The decision is yours now. The power to decide is at your fingertips. But whatever happens, I got your back. May God bless you on your decision. Ada, a current volunteer with Vincentian Service Corps West, blogged about her service experience as part of our ongoing Serving with Sisters Ambassadors series. This series is sponsored by CVN’s From Service to Sisterhood Initiative, a project made possible thanks to the support of the Conrad N. Hilton Foundation.